Monday was a great day: we visited the Ute Mountain Tribal Park. 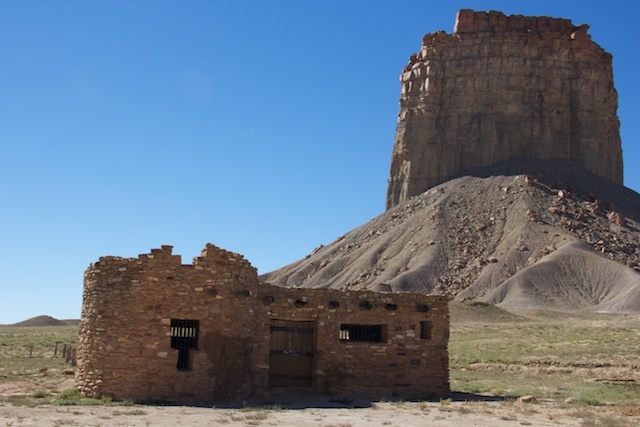 The Ute Mountain Tribal Park is a park on the Ute Mountain reservation, and it surrounds Mesa Verde National Park – and it has a lot in common with Mesa Verde: spectacular scenery and cliff dwellings, to name two. It also lacks something that Mesa Verde has tons of: visitors. Today’s tour of the Ute Mountain Tribal Park consisted of four people. That’s right: four. You could count us on one hand. It was an incredibly intimate tour, led by a Ute guide. We paid the $48 for the tour, plus an extra $12 to ride in the van with the guide. Quick note to those considering this trip: ride with the guide. While the initial drive was a nicely graveled road, the last bit was a narrow dirt road with some drop-offs that most cars cannot easily handle. 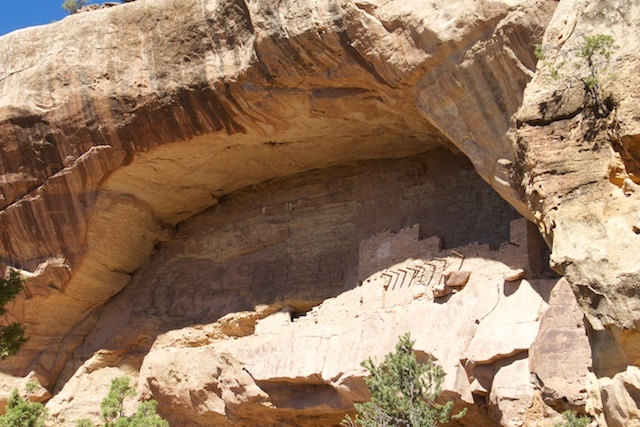 But enough about that – an hour after the tour started, we finally arrived – the first hour was spent driving to the site where the cliff dwellings were hiding. 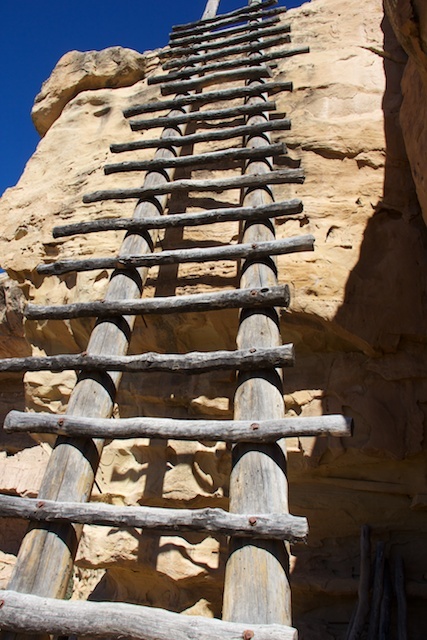 The first step on the tour is climbing down a series of ladders – three short ones, then one that was about 18 feet (about 5.5 meters). 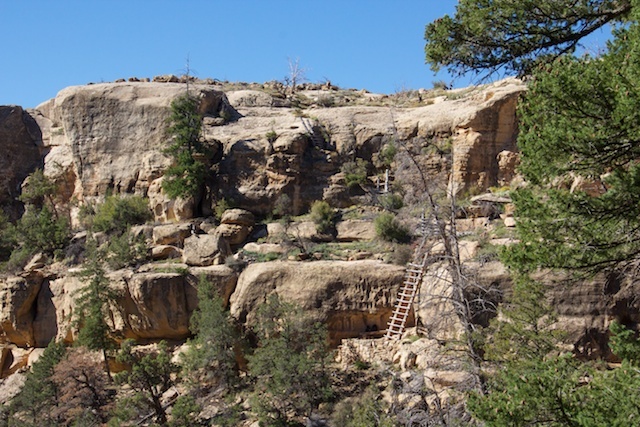 The Four Ladders Down (and Up) — one must climb these to see the Cliff Dwellings. 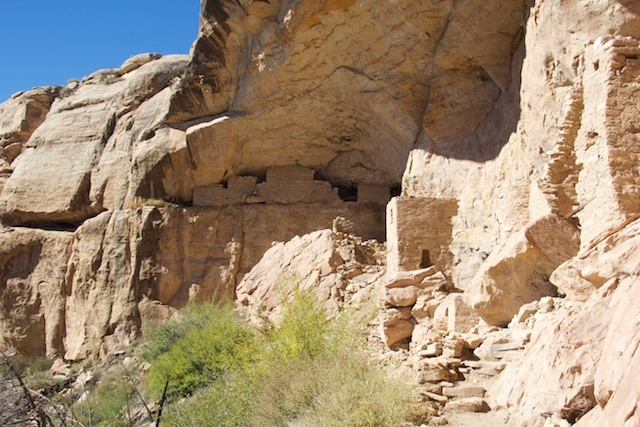 Once at the bottom, we visited three (or four) cliff dwellings: Tree House, Lion House, Morris 5, and Eagle Nest. Sunday we’d toured the Cliff Palace at Mesa Verde in a group of approximately 50 people. At Cliff Palace we received an interesting lecture. Monday there were five of us, including the guide, and while the same restrictions were in place (don’t climb on the walls, etc.…), the intimacy of the tour was much greater. Lion’s Nest — as you approach it. 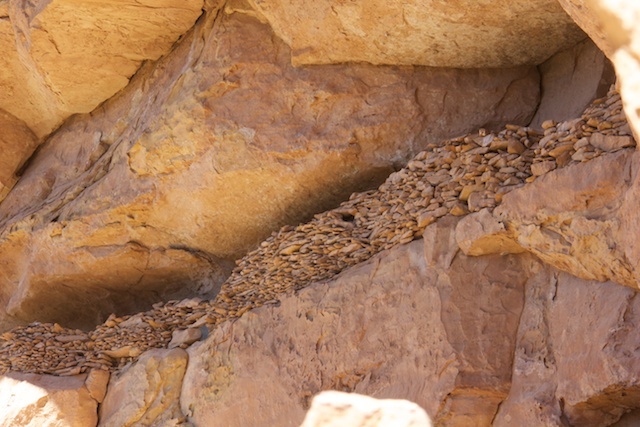 This area may have been a storage area for living turkeys. But our guide only speculated. I only visited the first three sites. The fourth, Eagle Nest, involved climbing up a 35 foot (10.6 meter) ladder – and, since I know myself, I did not attempt this ladder. 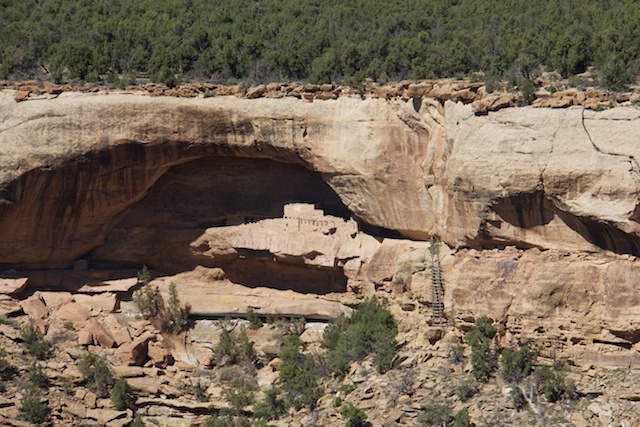 The Eagle Nest Cliff Dwelling — I did not go see it in person. This is the 35 foot (10.6 meter) ladder that stood between me and the Eagle Nest. The Eagle Nest, as seen from the opposite side of the canyon. You can see the ladder I did not climb. 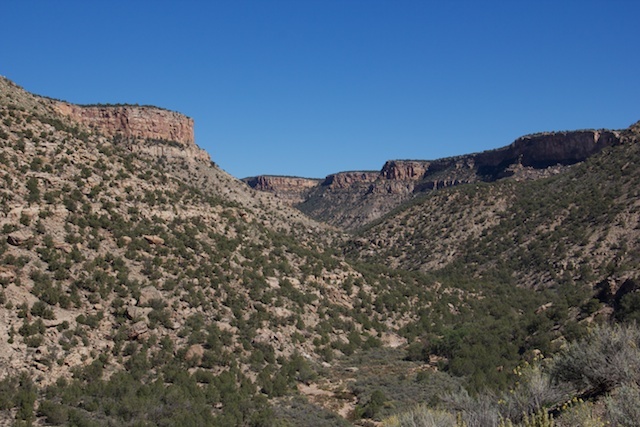 Once the morning was complete – we picnicked above the cliff dwellings, we drove around to another vantage point where we could see where we had been. We also saw numerous other cliff dwellings (but only from a distance), and then stopped to see two other interesting sites. This was the visitor center to the Ute Mountain Tribal Park, but it is closed today. Behind is Chimney Rock!